When the show starts in ITER's torus-shaped vacuum vessel, there are 45 diagnostic systems that will have front row seats. 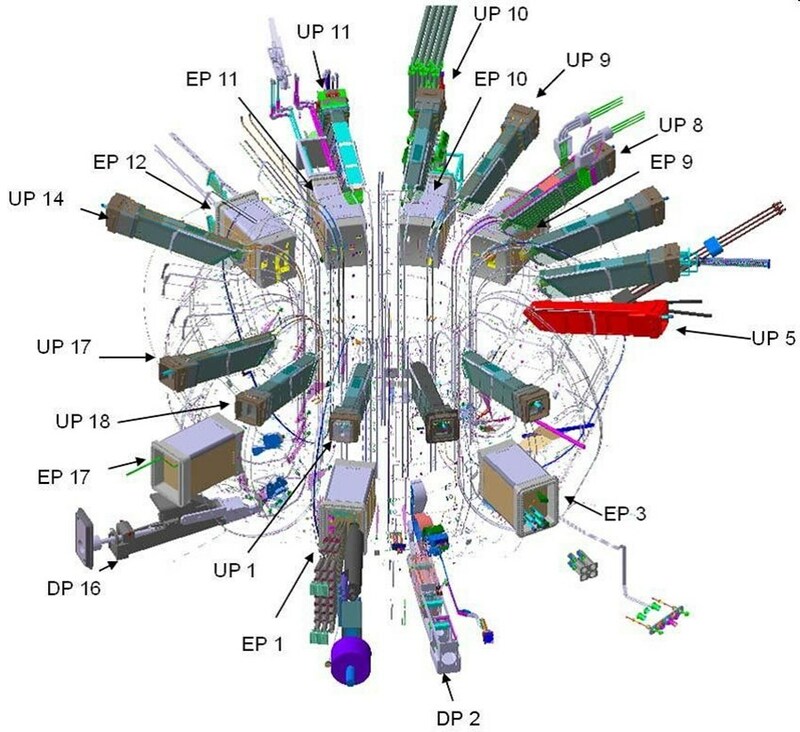 As a scientific experiment, ITER will have a wide range of instruments and sensors—far more than would be necessary in a commercial fusion reactor—whose task it will be to glean the maximum amount of information during plasma pulses. Most of these plasma measurement diagnostics are designed to capture light over a wide range of wavelengths. The instruments need to be close enough to "see" deep within the plasma, and yet avoid the full brunt of heat and radiation. They also require a wide and varied distribution around the vacuum vessel. The solution for ITER's diagnostics is to ride piggyback on massive components called port plugs. 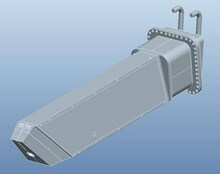 All around the vacuum vessel, access ports are planned for the installation, replacement or repair of in-vessel components. During operation, these openings will be sealed by large stainless steel plugs weighing up to 50 tonnes. "The port plugs are an ideal support for the diagnostics systems, which need to be present in most sectors—some looking directly into the plasma, others viewing the surfaces of the plasma-facing components (blanket and divertor)," explains Spencer Pitcher, physicist in the Diagnostics Division at ITER. At least 18 of ITER's 33 port plugs will be customized to house diagnostics. At the end of the 3-metre-long port plug (left), the diagnostic first wall captures light from the plasma, but is set back to avoid the brunt of heat and radiation. 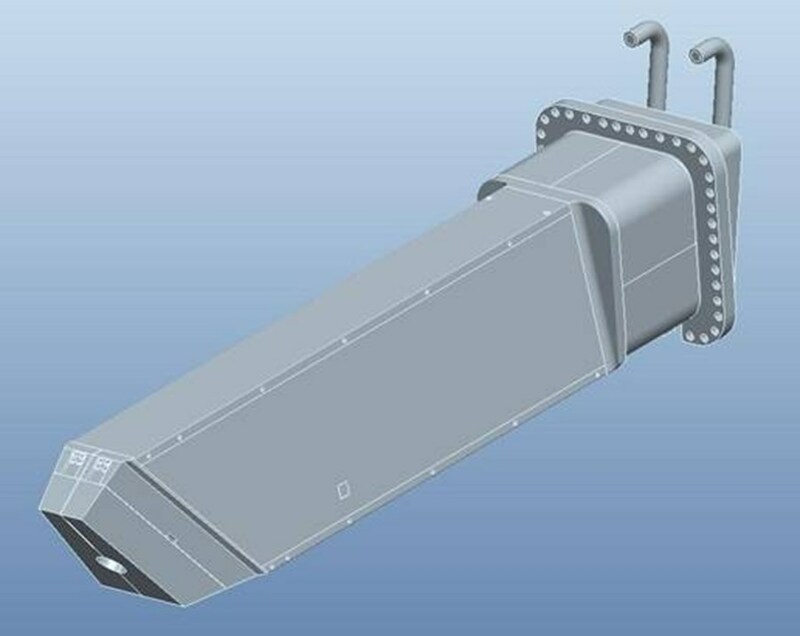 At the plasma end of the port plugs, the diagnostic first walls will be set back slightly from the vacuum vessel wall-mounted blankets. 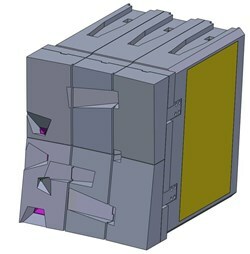 Like other wall-mounted blanket modules, each port-mounted blanket module will be formed of thick shielding blocks with a plasma-facing first wall element; unlike the others, the diagnostic first walls will be pierced with apertures to allow light to reach the diagnostic sensors. 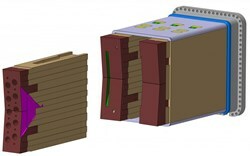 "We looked for a compromise between situating the diagnostic systems close enough to the plasma to capture light and far enough away to be protected," explains Doug Loesser from the Princeton Plasma Physics Laboratory, who is collaborating with Spencer on the diagnostic port plugs as part of a design Task Agreement signed between the ITER Organization and the US Domestic Agency. "We arrived at a 10-cm setback in order to protect the diagnostic first wall from direct plasma interaction. The diagnostic first wall will still receive some radiant heat flux—estimated at 0.35 MW per square metre max—but much less than the ITER wall-mounted blankets which must endure some plasma contact." In this equatorial port plug, six diagnostic systems are integrated in pairs onto drawer-like stainless steel modules. The first wall is curved to match the plasma in the centre of the machine. No two diagnostic first walls will be the same. At the equatorial level, multiple diagnostic systems may peer through the diagnostic first wall panels—six per equatorial port plug—integrated in pairs onto drawer-like stainless steel modules made up of a shielding and a first wall component. At the upper port level, the port plug will support two diagnostic first wall panels. Depending on the needs of the instruments, the distribution of the apertures in each diagnostic first wall—and the shape of each aperture—will vary. First wall designers have their hands full: for the first time in a tokamak, the diagnostics in ITER will require significant nuclear shielding and cooling. Space will have to be found for the diagnostic apertures as well as the cooling water that is only 5 mm below the stainless steel first wall surface. Each aperture will be oriented to capture light from a particular region of the plasma without allowing nuclear radiation to pass. For some diagnostics, an elaborate mirror system will be installed behind the first wall: light waves will bounce from mirror to mirror to reach the sensors, whereas nuclear radiation will be trapped by the thick stainless steel modules. For diagnostics that require a direct view of the plasma, holes will be pierced directly into the shielding block and plenty of steel placed along the way to absorb neutrons. 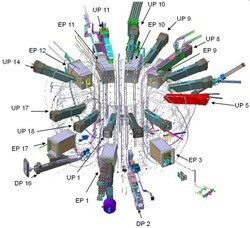 Like paparazzi closing in around a film star in Cannes, diagnostic systems will encircle the ITER plasma. "The design of the diagnostic first wall is quite a challenge," confirms Spencer, who checks in with Doug and his team of designers once or twice a week by video conference. "There are as many designs as diagnostic systems. For the moment we are working on a generic design. Based on an 'assumed diagnostic arrangement,' it allows us to develop methodology and technology." Design, fabrication, and delivery fall under the responsibility of the ITER Organization. Each diagnostic first wall will require six months of fabrication and testing; the choice of manufacturers will be decided by international tender in 2015. The Conceptual Design Review of the generic diagnostic first wall was held in June 2011. "We will continue working on the generic design up until the Final Design Review two years from now," says Spencer. "After that, the designs for each specific diagnostic will require 'tweaking' of the generic design. This specific aperture work will commence when the designs of the specific diagnostics are ready."